Gor Mahia coach Dylan Kerr is disinterested in re-signing Kenneth Muguna and Musa Mohamed. Earlier reports indicated that Muguna was on his way back to the club, a move that was welcomed by many fans. Gor Mahia head coach Dylan Kerr has slammed the door on Musa Mohamed and Kenneth Mohamed effectively blocking their potential return to the club. In an interview with Citizen Digital, the Briton coach claimed that the duo were duped to ditch Gor, with the promise of better salaries at KF Tirana of Albania noting that there is no chance of them of returning to K’Ogalo . Kerr’s sentiments contradict the stance of club deputy secretary Ronald Ngala who in a separate interview said that Muguna had signaled his desire to return to the Kenyan champions. “He shouldn’t even be back in the first place. They paid a lot of money to acquire him… we cannot help Muguna … because it was his own decision to ditch Gor Mahia,’’ Kerr stated. Kerr added that Musa Mohamed “made a mistake” and was duped to leave the club with empty promises of playing for bigger clubs in Europe. ‘’I have many good players and my main agenda is to make them better. Where will I take my players who currently make my squad? I want to nurture them and better their forms other than go for new players,”Kerr said. The Briton who has led Gor to two successive League titles, Cecafa Club Championship semi finals and to the Caf- Confederations group stages is on record saying he has enough players for any assignment. Musa Mohamed and Kenneth Muguna ditched Gor at the beginning of the season to join Gor’s former coach Fereira Marcelo ‘’Ze Maria’’ at Tirana in Albania but the honey moon failed to last as they failed to impress. Mohamed currently plies his trade in the Zambian Premier League with Nkana Red Devils and it remains unclear if he settled at the club. Where will I take my players who currently make up the squad? Kerr should should know that once the transfer window opens, there is a likelihood some of the current players will move to other clubs.So either way, he will still recruit a few new players. Also, there is the question of personal working relationship. If Kerr feels he has no chemistry/personal working relationship with Muguna and Musa Muhammed may be due to their closeness to the former coach, “Ze Maria”, then there is no need of them coming back to Gor Mahia because they will just be warming the bench. Players should know that they need to work with the current coach and let go their personal relationship with former coaches who had moved on. hehehehe Kerr swallow your pride, Football like politics has no permanent enemies…… just hope they will not move to AFC and torment Kogallo. A few weeks ago, we were told by one Gor Mahia official that Muguna has penned a four year-contract. Ker, the way I know Gor Mahia, if you lock Muguna out and you don’t strengthen the squad the way you are threatening and then you fail to deliver in the first 5 matches of next season, don’t be surprised if you find yourself in the earliest flight back to Britain. I have advised you as a friend. Who said Musa wants to come back?I thought he was just getting settled in Zambia?!! lately we ate so acidic. it doesnt help anyone including yourselves. please let the coach be. we judge him after 5 games. why warn him. just wish him well. u can only offer your good advice or even bad…which has never helped kogallo to be managed better. why not warn the ec. who do drama day n nite ruining the clubs prospects n bringi g embarasments…give kerr a break! Of late Kerr has been whining tooooooooo much ! i dont know what has become of this once upon a time, a good on field coach, perhaps it is time we look elsewhere as clearly both on field and off field performance has deteriorated. Joining Gor ups your game. I think Muguna went a step too early before he could turn into some gem… unlike Marcelo Ouma who blossomed too fast. Muguna “severly” bit the hand that was feeding him. I thnk he should stay away from Gor. On the other hand Musa leaving was on other factors other than rebellion. He took a bad gamble but he did not betray Gor Mahia. He is the type of player Gor needs and should be taken back if a chance comes. He developed well at Gor. The defence needs guidance and he is the type of player that can fill that gap. On the other hand I wonder why Kerr has a beef with these two players. Can they take instructions? that’s what matters. The club and the Kenya scene has now changed. The era where Gor signed players simply coz of “birthright” is long gone. Players now have to think hard before signing. On the other hand a weak EC has given rise or encouraged these “defections”. Muguna should have been made to sit on the bench. Why has EC continuously given into tantrums… unless they themselves were beneficiaries!! Why exactly did Walusimbi go… were they that powerless? Has Gor EC has been silenced into submission? All the same Kerr is the coach, on my part all I want are the victories. Anybody who has had a chance to read Futaa.com will find that Aduda has said TODAY that Gor will be looking to sign Muguna once the transfer window opens. So Kerr says one thing today, Aduda says the exact opposite the following day. Mano e Gor wa ma pile. On a personal note, however , I would support the signing of Muguna. He was such a marvel to watch…..Wendo has regressed and Mieno is becoming too slow albeit still having one of the best football brains locally. Imagine a double pivot of Muguna and Dunco with Kahata in front of them plying the free role behind the striker!!!! If Kerr does not want him back then he must sign a similar or better alternative. His mantra of I am happy with the players I have that we heard in the June window will not wash when it comes to he continental scene. Let the determinant be whether he can improve our skill-less midfield and not that he was duped into leaving. That would be petty!!!! N/B: I still support Kerr as our coach and will always do as long as he continues to deliver. At the same time my objective self feels duty bound to criticize him whenever he gives me a reason to!!! @musymo and jasego…I don’t watch Afc leopards games much unless when playing kogalo. Just wanted to find out,how good is Duncan Otieno and can he be a worth addition to our midfield? He should calm down bwana. Many Kogalo players sought greener pastures then came back and thrived: Blackberry, Kagere, na wengineo. We can keep Muguna for 1 year before he seeks greener pastures. Harambee Stars stand-in captain Musa Mohammed has blasted his former coach at Gor Mahia Dylan Kerr, accusing him of employing ‘negative energy’ and settling scores through the media. Mohammed, who recently joined Zambian side Nkana FC, has also reminded Kerr that he is currently riding on the successes he worked hard to build as a player and captain during his seven-year stint at K’Ogalo. The 27-year old central defender, who captained Kenya during the recent wins over Ghana and Zambia in Nairobi, was forced on the defensive after Kerr was quoted by Citizen Digital as saying he and midfielder Kenneth Muguna will never play for the Mahia for as long as he remains in charge. “I will not dwell on negative energy that will not only derail my reputation but that of a club (read Gor Mahia) that made me a household name,” Mohammed said. Both Mohammed and Muguna quit the Kenyan champions at the start of this year for Albanian side FK Tirana in controversial circumstances but their moves at the European team didn’t last. Mohammed was dropped two months after joining Tirana with Coach Ze Maria, who also coached him at Gor, explaining that the club was forced let go off him after he failed to settle in Europe. 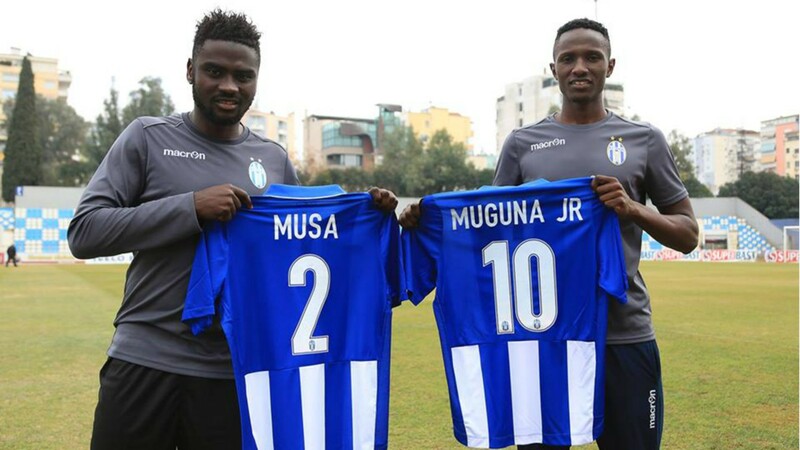 Muguna who cost Tirana Sh4 million was also dropped in July – six months after signing a four-year contract. Kerr has since accused these two players of being ‘duped’ to ditch Gor Mahia, a club he has led to successive league titles and to the group stage of the Caf Confederation Cup. Kerr’s comments will in the meantime leave Muguna in a precarious position. Now clubless, Nairobi News understands the attacking midfielder has shaken hands on an agreement to re-sign for Gor Mahia even though he is yet to sign the deal. Jasego Gor needs a proven goalkeeping coach like by yesterday. Very crucial matches were lost because of keeper errors. That should be a very vital area to begin with. Honestly speaking Muguna should be reconsidered .With these reports of player boycott due to money issues, Kahata is on his way out. Who then is the other creative midfielder worthy of his position? Kerr has overreacted on this matter and should have remained silent. All of us need money and better living. So i can’t blame both Musa and Miguna for leaving to Terana. My only problem especially with Miguna is that he never had any regard to the Club that helped him to be known . Musa is still appriciating Kogalo and is within the public domains. Musa is one of the players who sacrificed their time and profession to built our club and when he want come back he should be considered. Why complaints after complaints from bloggers on Muguna and Musa? Players and coaches come and go. I would prefer Muguna to come back but all will depend with the coach and player himself. It great to play for Gor Mahia and we have young players that need to be integrated into the senior team. Players like Alphy Onyango (Kakamega High and Gor Mahia Youth), Kevington Machika (Kakamega High and Gor Mahia Youth), Evans Odhiambo (Kakamega High and Gor Mahia Youth) etc can be great assets to the team going forward. I am being told that Gor Mahia had at least 5 players during the Kenya Secondary Schools football games and such players can be nurtured and become great in future. Nyani kweli haoni kolunde….. you castigate guys rooting for Dunco but in the same post you advocate for Muguna!!! !What makes your crusade holier than theirs? What makes you think it is a spirited campaign when only @jasego and myself have mentioned him? It is close to the transfer period and always at that time, bloggers on this wall always WISH for their desired signings which 80% of the time do not come true so just allow the campaigners to voice their wishes which most probably nobody in the TB or EC is giving a hoot about……If you can compare Dunco to Wendo then you may need a visit to the optician. Wendo could have become the next Wanyama and I was and is still one of his greatest admirers but if you have watched his game in the second leg you should have enough reason to be worried. Mbish is a fighter but does not influence games for the full 90 minutes. You claim to watch AFC matches, then I would assume you watch even more of Gor Mahia’s and you will tell me that Mbish disappears in certain games but brings his A game in others and that is not we can conquer the continent. The same applies to Bena, Lawi…Mieno is still a guru but lacks that dynamism that made him so exciting to watch…Age must be catching up and we need a dynamo in that midfield who will deliver day and night….in the mould of Baba Kizito and Aucho..For the local league, those you mentioned will do but not continentally where they will do well as squad players either starting the game and getting subbed or coming in as subs depending on the situation. The fact that majority of players who cross from one of the rivals to the other flop is not reason enough to conclude it has to go that way always. Look at the careers of Tom Juma and Mathew Ottamax and tell me if your argument is still valid!!! 2) Let us be concerned with performance on the pitch. If Walusimbi is to be thrown out by KC tomorrow, should we welcome him with open arms and a lucrative deal? This talk of “giving the coach 5 matches ” is retrogressive. We should advocate for continuity in our club system.I was shocked the other day one @jakoyo calling for Kerr to be replayed by Zico simply becoz he lost the shields cup.,talk of one getting his priorities “ataro” . With this kind of thinking we will always stagnate, one step forward, two steps backwards. @level mind, I think we need to learn from the experience of 2018. I am not calling for Kerr to be replaced , i have just made a proposal to the powers that be …From 2019 we consider the head coach for squad management responsibility under CAF, CECAFA and KPL league tournament while the deputy coach should be assigned squad management responsibility for shield cup and sportpesa cup and any other cup such as charity shield etc etc. This shared roles will bring about accountability, improved player and squad management and improved on pitch performance.